According to Pere Daniel the Dragoon corp. got its origins under the reign of Henry II, with the mounted arquebusiers, created in 1554. Those were mostly small units of infantrymen, traveling on horses and firing when dismounted. 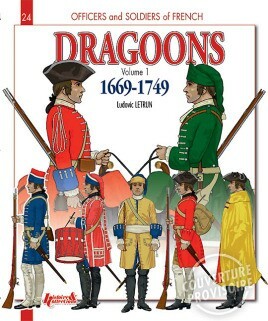 The nickname dragoon actually appeared later, under the reign of Henri III, and designates as well mounted arquebusiers, carabiniers and musketeers. In this book, you will discover the magnificent uniforms of those cavalrymen, from the first XVIIth century wars, to the battles led by Louis XV's generals. 66 plates illustrated 200 horsemen and 60 flags.